The Scout Section is for young people, usually aged between 10½ and 14 years. A young person can come into the Troop at 10 and may stay until they are 14½ years old. The Scout Troop is the third section in the Scout Group, above Beavers and Cubs. 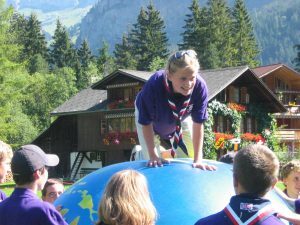 Scouts take part in a Balanced Programme that helps them to find out about the world in which they live, encourages them to know their own abilities and the importance of keeping fit, and helps develop their creative talents. It also provides opportunities to explore their own values and personal attitudes. Being outdoors is important, and half the programme is given over to taking part in traditional Scouting skills, such as camping, survival and cooking, as well as a wider spectrum of adventurous activities, from abseiling to zorbing. A Scout Troop is divided into small groups called Patrols, each headed up by an older Scout called a Patrol Leader, and often with an Assistant Patrol Leader. Scouting is about being with friends, as part of a team, and participating fully in the adventure and opportunities of life.